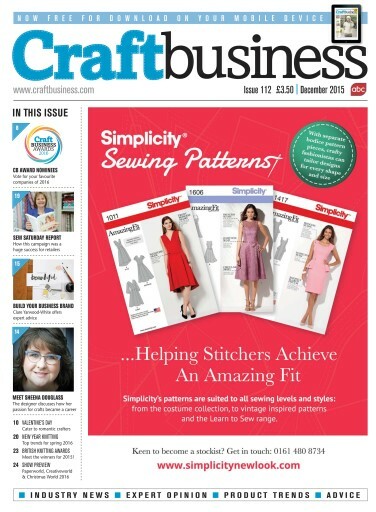 Welcome to the December issue of Craft Business. This month we meet rubber stamping expert, product designer and TV presenter Sheena Douglass, who reveals how her love of crafts led to her current successful career on p14. Then on p15, brand & marketing consultant Clare Yarwood-White offers her expert advice how to develop a successful brand for your craft business. We also have a sneak preview of the popular Creativeworld, Paperworld and Christmasworld trade shows, which bring the very latest and best products and trends from around the world to Frankfurt in January next year. These fairs are set to be even bigger and better than before; find out more on p24. October 17 saw sewing and fabric shops all over the UK celebrate Sew Saturday, the new campaign to promote bricks and mortar outlets. The event was a huge success and we discover how many of you got involved on p19. We also reveal the winners of the British Knitting Awards 2015 on p23, from manufacturers to independent knitting shops – congratulations to you all! 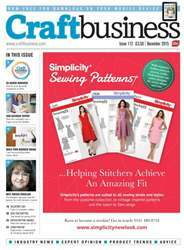 Remaining with the subject of awards, we now have the full shortlist of nominations for the prestigious Craft Business Awards 2016 on p8. This provides you with the opportunity to have your say on which are the craft industry's best manufacturers, wholesalers and distributors. Impressed with their products, website or level of service? Simply visit our website and fill in the online voting form now.